In this note we consider two headline points in relation to Landsbanki Island hf: (1) the responsibility of the Icelandic Government in respect of its obligations to the Icesave depositors under Directive 94/19/EC (the “Directive”); and (2) the Landsbanki Freezing Order in place in relation to the London Branch Assets. 2.1 The UK and Dutch Governments state that Iceland is liable under the EEA Agreement and the Directive to compensate the Icesave depositors to the extent of the minimum amount to be guaranteed under the Directive, in the event that the Icelandic Depositors’ and Investors’ Guarantee Fund (“DIGF”) does not provide compensation in that amount. The matter turns upon whether the Directive requires Iceland to achieve the result that the Icesave depositors receive the minimum payment, or simply requires Iceland to implement and monitor a scheme directed at that result. 2.2 We have received and are considering a number of legal opinions on this point, but we understand the previous Icelandic Government never actually requested a formal UK legal opinion on this matter. We have closely studied the Directive and the relevant case law and in our preliminary view, whilst the legal opinions from the English and Dutch Government are elegant, we are not persuaded that they are the definitive answer to this question, in particular when you look at the stated purpose of Directive. European Directives are not always crystal clear and this one is no exception, and there are arguments either way, but we have yet to find clear-cut answers that demonstrate that there exists an obligation for Iceland to guarantee payments from the DIGF. Therefore we believe it is vital for the Icelandic Government to instruct us to produce a definite legal opinion on this issue by a leading barrister (QC). 2.3 We understand that the UK Government is anxious that the matter not be referred to the courts for an independent determination and therefore we suggest that the uncertainty on the position referred to above, coupled with the UK’s unwillingness to risk an adverse determination in an independent court, could produce a useful a negotiating tool. 2.4 The UK Government may argue that, whether or not Iceland is legally required to do so, Iceland has actually agreed to compensate depositors to the extent of the minimum provided for in the Directive. There are some confusing and contradictory statements in correspondence from the Ministry of Business Affairs including letters dated 20 August 2008, 5 October 2008 and 16 December 2008. However we do not consider that these statements, whilst unhelpful, legally bind Iceland to go beyond its legal obligations under the EEA Agreement and the Directive. 2.5 The Agreed Guidelines of 16 November 2008 seem to us to be a “fudge” of the matter; which simply parked this dispute at that time. The Agreed Guidelines merely state that the Directive applies to Iceland in the same way as to the EU Member States. Following the announcement of the Agreed Guidelines, some Ministers did however gave certain statements which suggested that Iceland was committed to guaranteeing payments from the DIGF. However we do not consider those statements to have any legal force. 2.6 As to the Memorandum of Understanding with the Dutch authorities, that document presupposed that a further document establishing terms would be prepared. However, no such further document was prepared, and the Dutch never advanced any sums to the DIGF as provided for in the MOU. Moreover, no MOU was ever prepared between Iceland and the UK. 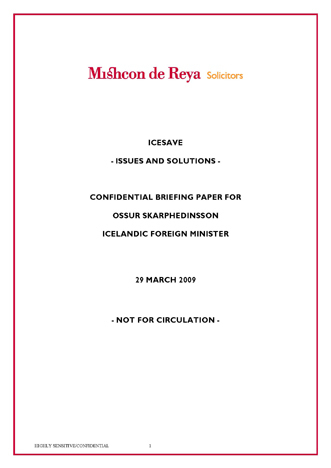 2.7 In short we have yet to see any written evidence that Iceland has formally undertaken to guarantee the DIGF’s obligations in respect of the Icesave deposits, or undertake any obligations other than those under the Directive as implemented by Law 98/1999. Finally, in any event, we understand, from the Icelandic legal opinions provided to us, that such an agreement to guarantee the DIGF would always require legislative approval by the Icelandic Althing to become legally binding. 3.1 The time limit to seek Judicial Review of the Freezing Order expired, at the very latest, on 7 January 2009. It is possible that, were the Freezing Order to be extended at the end of its fixed duration of two years (which we expect), the decision to extend would be susceptible to Judicial Review. Furthermore, the UK Government’s refusal to allow the London Branch Assets to be released into an insolvency process may be susceptible to Judicial Review on a stand-alone basis. However, we do not consider Judicial Review to be the best route to finding a resolution of the issues between the Iceland and UK Governments. 3.2 The existence of the Freezing Order leaves the London Branch Assets in limbo. The London Branch Assets cannot be administered in a UK liquidation or administration due to the provisions of the UK’s Credit Institutions (Reorganisation and Winding Up) Regulations 2004 (SI 2004/1045) the (“2004 Regulations”). This is not an attractive proposition for the UK Government, who we believe want an agreed exit strategy, which will result in an orderly winding up of the London Branch’s affairs. In this respect we consider that an Icelandic initiative involving the cooperation of Landsbanki in Iceland (through the Resolution Committee) could be attractive to the UK Government in facilitating an orderly exit from this stalemate. 3.3 The removal of the Freezing Order will require the co-operation of the UK Government. Persuading the UK Government to give their co-operation will depend on what Landsbanki agrees should happen to the London Branch Assets, possibly with the assistance of the Icelandic courts. An important factor in obtaining UK Government consent to any release of London Branch Assets would be an exchange of information about those assets, how they might be managed to maximise their value and then allocated to the Icesave depositors, including the FSCS and the DNB. Ernst & Young in London have under the Freezing Order regularly reported to HM Treasury information about the London Branch so the UK Government is up to speed on the assets therein. 3.4 The Freezing Order itself provides for the UK Government to grant “Article 6” licences, and this could be a convenient mechanism to allow the release of the London Branch Assets in a structured manner, agreed by both sides. 3.5.2 to recognise an agent appointed by a competent officer, with authority to implement the Icelandic version of administration/liquidation, which has effect in the United Kingdom as if it were a part of the general law of insolvency of the United Kingdom, under the 2004 Regulations. 3.6 In either event, the London Branch Assets would be under the control of an officer (or quasi officer) of the Court, with the result that the controversial Freezing Order granted under the provisions of the UK Anti-Terrorism, Crime and Security Act 2001 would cease to have a purpose and could simply be withdrawn by the UK Government therefore terminating the delicate terrorism issue. In either event also we consider that it would be sensible and equitable that the officer appointed in this respect be chosen by the Icelandic rather than the UK Government. The reason for this would be to ensure that the Iceland receives full consultation and reporting throughout the process. The appointee would need to be acceptable to the UK Government, but should not be conflicted by any other material involvement in relation to this matter. We would be pleased to make suggestions or recommendations in this regard if that might be helpful. 3.7.1 We understand from information provided by the Icesave Committee (Áslaug Árnadottir) that the Icesave depositors (both retail and wholesale) are preferred creditors in accordance Icelandic Law, with the result that the Icesave depositors will continue to have a claim against the Icelandic assets of Landsbanki for any shortfall on their recovery from the London Branch Assets. 3.7.2 A further consideration is the position of other creditors, both senior and subordinated to the Icesave depositors. Further information from Landsbanki will therefore be required to evaluate the likely impact of on each class of creditor of the release of London Branch Assets to the benefit of Icesave depositors. 3.7.3 As to the FSCS, the UK FSA’s rules provide that the FSCS may make payments of compensation conditional on the claimant assigning or transferring the whole or any part of all such rights as he may have, on such terms as the FSCS determines are appropriate. Whilst we have yet to obtain a copy of the precise wording of the relevant assignments, it is highly likely that the compensated Icesave depositors assigned their rights in relation to their Icesave deposits to the FSCS. We have no reason to believe that the assignments will be invalid. Whether the FSCS is a preferential creditor in an Icelandic insolvency situation is, however, a matter of Icelandic law but we understand that the issue is unclear. It is however certain that the UK Government will take the view that FSCS should have the same preferred status as the UK Icesave depositors in much the same manner as Icelandic law allows for the DIGF to be a preferred creditor. 3.7.4 We assume in principle that the same order of preference would apply in relation to the Dutch DNB deposit guarantee scheme, which would in principle then be treated in the same manner as the FSCS in regards to claims in Iceland against Landsbanki. To what extent this may be complicated by the recent unhelpful developments here is not yet clear (to us anyway) and this is a question we would propose to immediately canvass with the representatives of the UK Treasury with whom we are now in constructive communication. 3.8 It will be vital in any negotiation to understand clearly (1) who is entitled to claim the Landsbanki assets, including the assets frozen in London, (2) the order in which those claimants are entitled to those assets and (3) the actual value of Landsbanki’s assets as a whole, and those of its London Branch. These matters will impact upon whether our proposed exit strategy is perceived by the UK Government to be legally workable, and to the commercial attractiveness of our proposal. 4.1 We do not propose to cover in this short note the other, less direct matters, that we discussed at our meetings on Thursday and Friday of last week but can produce a note on those when required. 4.2 We have not yet had an opportunity to fully digest or discuss with you the contents and conclusions of your meeting at Landsbanki London office on Friday afternoon. However this does seem to have produced potentially good news in terms of the assets and realisations potentially available. However, at first sight the formative suggestions being floated by that office in terms of a 5 year plan and bonding mechanism are not immediately wildly attractive. We also understand that there are further important documents held by the Landsbanki Resolution Committee that were shown to G during that meeting which would be very helpful to see as soon as possible. 5.1 Our initial contact with Lord Paul Myners, the Financial Services Minister at the Treasury and other Treasury representatives has been very constructive and we think, at the very least, indicates a genuine desire to promptly commence exploring a solution to these matters. This makes sense as there is obvious political expediency (as well as economic) to this in UK. 5.2 Our preliminary opinion does not agree with the legal opinions that we have seen as were produced on behalf of the UK and Netherlands in respect of the Directive. Our view is that the Directive is not clear and that there are respectable arguments either way. Put in another way, we do not agree that there is a clear liability on Iceland under the EEA Agreement and we do think it would be very helpful for the Icelandic Government to instruct us to procure a leading barrister´s (QC) legal opinion in this respect to redress the current legal imbalance. 5.3 There is no coherent or immediate independent prospect of legally removing the Landsbanki Freezing Order anytime soon; but also neither do we see an easy or convenient way for the UK Government to do so (without considerable loss of face and economic uncertainty). We have suggested in outline a mechanism whereby Iceland could helpfully assist the UK Government in this respect, in conjunction with an overall agreement as to compensation as regards the Icesave depositors including the FSCS. In this respect we do now need to spend some effort in looking at this aspect in greater detail, particularly running some financial modelling with the figures so as to produce some possible approximate draft outcome statements. 5.4 In short, the mechanism we are considering might sensibly involve transferring the assets of the London Branch to an “Newco”, to be presided over by a UK Administrator or agent as under Icelandic law, nominated by Iceland, to best commercially realise those assets and then to distribute them according to law, subject to the agreement between the Icelandic and UK Governments, taking into account the effective force majeur (but also inconvenient stalemate) of the present position. The precise form of distribution of course depends upon a number of factors including value, agreement as to priorities and acceptance of certain political imperatives. However we do think this should be an achievable plan, certainly legally, with constructive cooperation on both sides. It would also conveniently facilitate removal of the Freezing Order and therefore removal of the repugnant apparent status issue it produces. Mishcon de Reya were instructed on this matter less than two weeks ago, and the above advice has been prepared on the basis of documentation received by us less than 72 hours prior to the drafting of this note. As a consequence the contents of this note should not be regarded as definitive and may be subject to amendment once all documentation provided to us has been fully considered.